May is Mediterranean Diet Month, which pairs perfectly with Healthy Eating Month here at The Weekend Gourmet. The Mediterranean Diet is a nutritional recommendation inspired by the traditional dietary patterns of southern Italy, Greece and Spain. 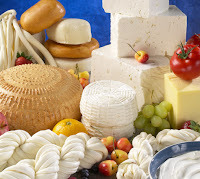 The key components of this way of eating include focusing on eating more olive oil, legumes, fruits and vegetables, fish, lowfat cheese and yogurt -- along with moderate wine consumption. These are great building blocks for any healthy eating plan! California-based Karoun Dairies recently sent me a variety of their lowfat yogurt, cheeses, and labne to create a healthy Mediterranean recipe for you. I received olive and thyme feta, grilling cheese (aka haloumi), yogurt, and labne (lab-neh). If you’ve never tried labne, chances are you will soon! 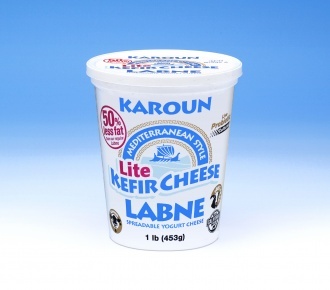 Labne was recently announced as one of the hottest new food products by Phil Lempert, the Supermarket Guru. It’s basically a delicious strained yogurt spread. It’s thick and tangy…and very versatile. 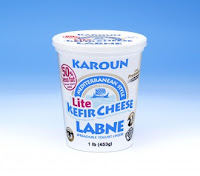 The probiotic bacteria in Karoun labne offers support for the immune system and aids in the digestion of food. We enjoyed the grilling cheese very simply, grilling it in a non-stick pan and wrapping it in pita bread. I was so simple and so delicious! It gets a nice golden crust on the outside, and it's gooey on the inside. For the labne and feta, I decided to make a dip that's full of chunky veggies and a Mediterranean spice mix called dukkah. If you’ve never had dukkah before, you’re in for a treat! This spice blend contains crushed almonds, seeds, and spices. I found my dukkah at Trader Joe’s this week, but you should be able to find it at any international grocery or large spice company. My Mediterranean Labne-Dukkah Dip is super quick to make and unbelievably good. As an added bonus, it's low in fat and healthy to boot! This versatile dip is thick enough to servevwith pita chips, but it can also be used as a topping for grilled chicken kabobs -- similar to tzatziki. If you can’t get your hands on the dukkah spice blend, I’ll give you suggestions to replicate it from easy-to-find spices you probably already have in your kitchen. Step 2: Stir well to combine and refrigerate for at least 30 minutes to allow the flavors to mix. I made mine a day ahead, and it was fantastic! Serve with pita chips or toasted pita bread for a dip or as part of a mezze plate. It can also be used as a sauce; I grilled chicken kabobs and served them over rice, then spooned some of the sauce on top of the skewers. I then put the chicken and the sauce inside toasted pita bread. This was a great combination! I loved this creamy, refreshing sauce as both a dip and as a topping for my chicken kabobs. My kabobs were quite spicy, so the sauce provided a refreshing cooling effect. The veggies are crisp, and the feta provided a nice salty sharpness. As most of you know, I have a huge aversion to olives. However, their briny saltiness was actually perfect in this feta…along with the thyme. This healthy, lowfat condiment is definitely a keeper and will be part of our Summer grilling repertoire the next few months. Disclosure: Karoun Dairies sent me a sampling of their yogurt, labne, and feta cheese to facilitate this post. The opinions expressed and the recipe featured are my own.